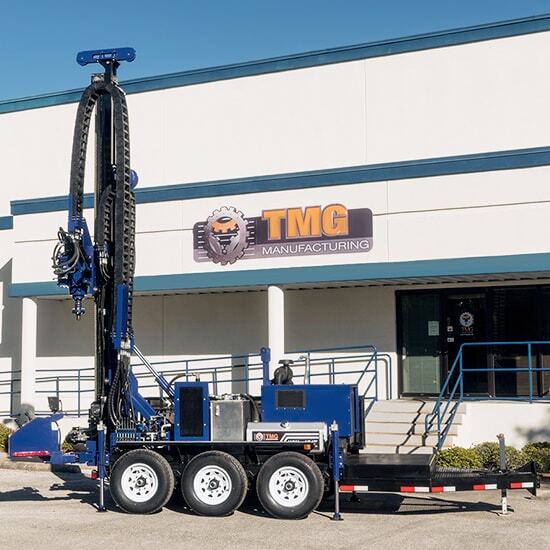 TMG Manufacturing offers an extensive line of quality underpinning & compaction grouting products, installation equipment and both compaction drill rigs and test rigs. 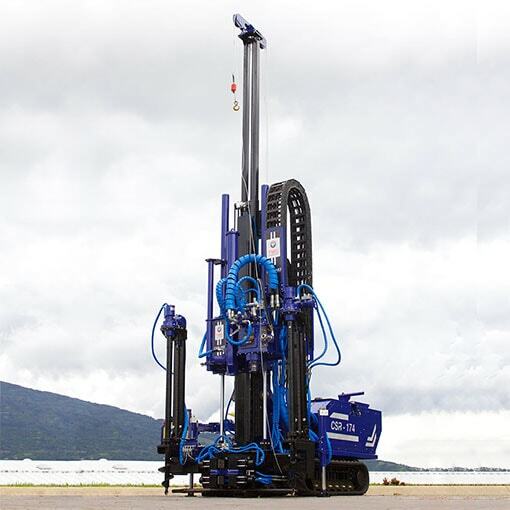 TMG manufactures the first ever purpose built combination SPT, CPT, rotary drilling and wireline coring drill rig. 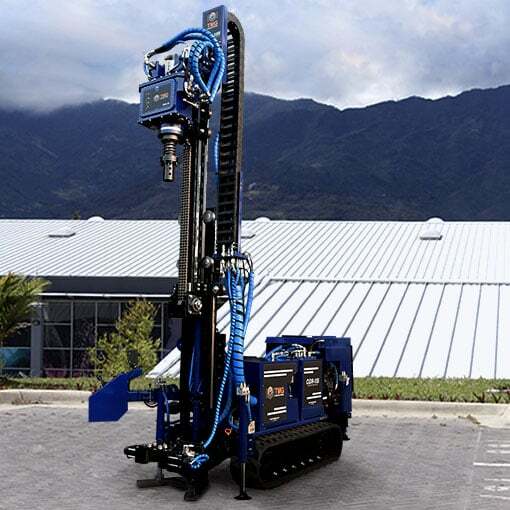 Having the versatility to auger drill, rotary/mud drill, SPT hammer testing and full-function CPT testing in ONE compact track mounted drill rig, is a first in the industry. 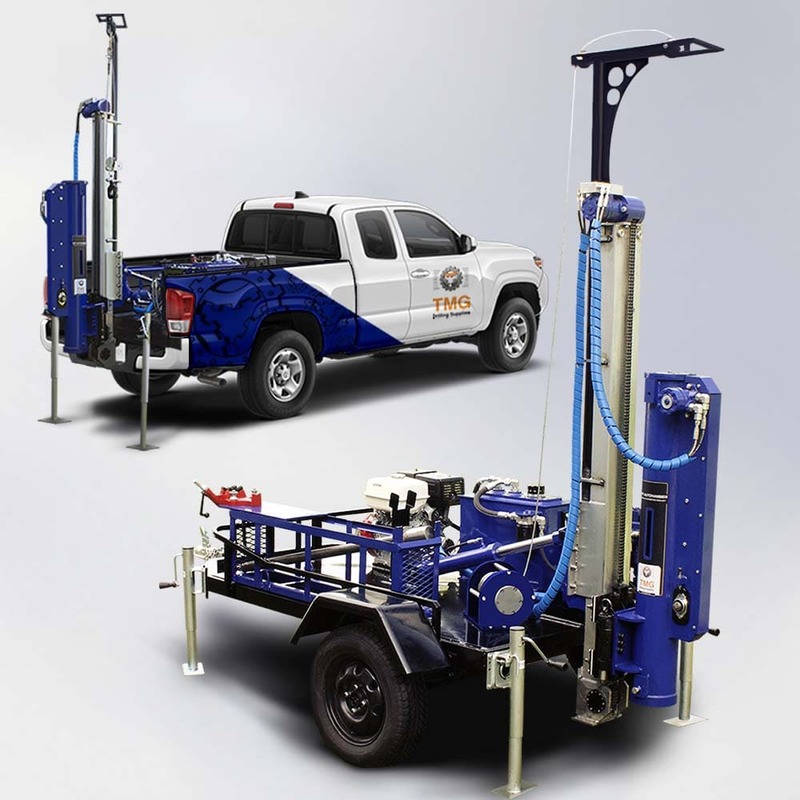 TMG manufactures a line of powerful and compact SPT test rigs designed for the geotechnical engineer. 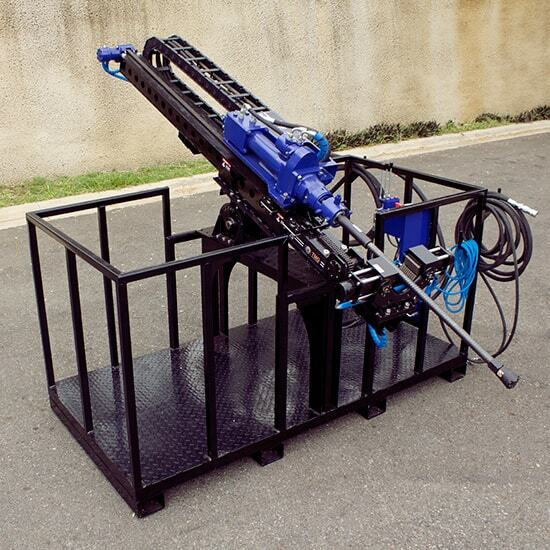 Our SPT test drill rigs are used for rotary drilling, testing and soil sampling. 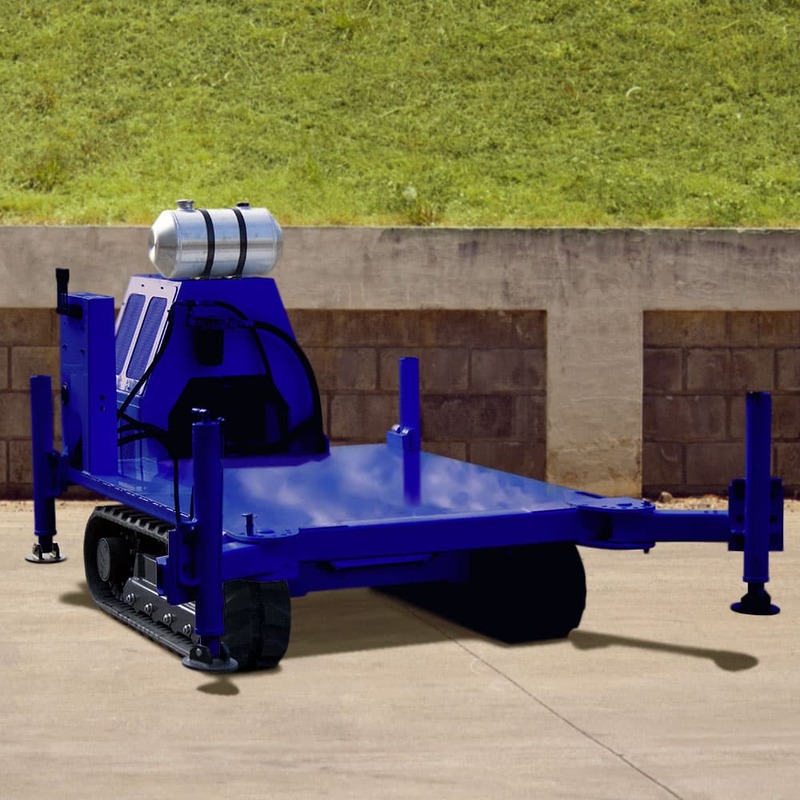 Our CPT rigs are compact, highly maneuverable and are available in 10 and 20 ton push capacity configuration. 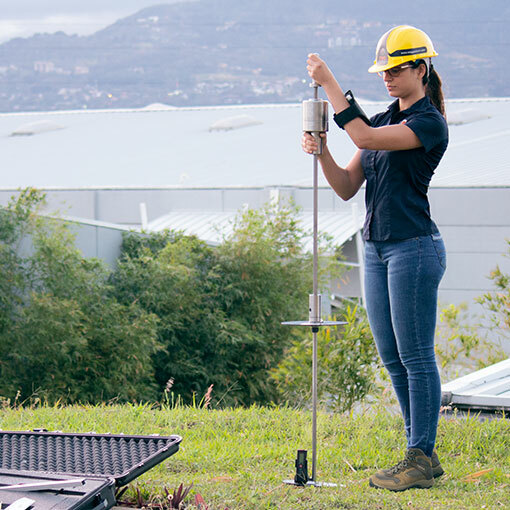 The CPT cone soil test rigs are built on a track system that enable all terrain maneuverability and ease of transport. Our new trailer mounted water well drill rig is now available. Get a quote on this water well drilling and rotary drilling trailer mounted rig and customize it to your needs. Engine size, axle configuration and rotary drill head gearbox size are just a few of the options you can modify. 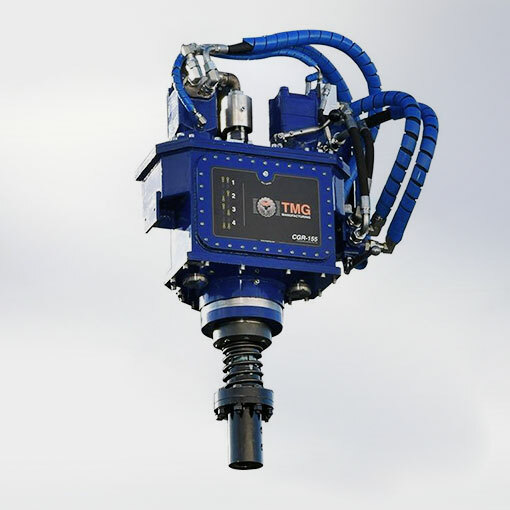 TMG manufactures a compact and very powerful micropile and rotary drill rig designed for the foundation and remediation contractor. 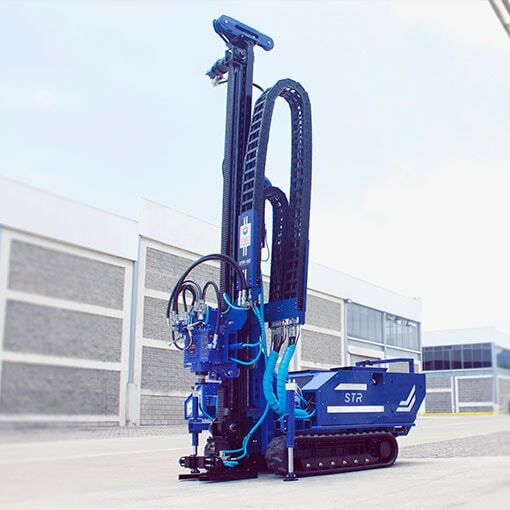 These amazing rigs are compact, highly maneuverable and designed to install micropiles, helical piles, drill in piers, and compaction grouting casing quickly and efficiently. This drilling equipment for soil nail installation, is connected to a hydraulic power unit, though long hydraulic hoses. 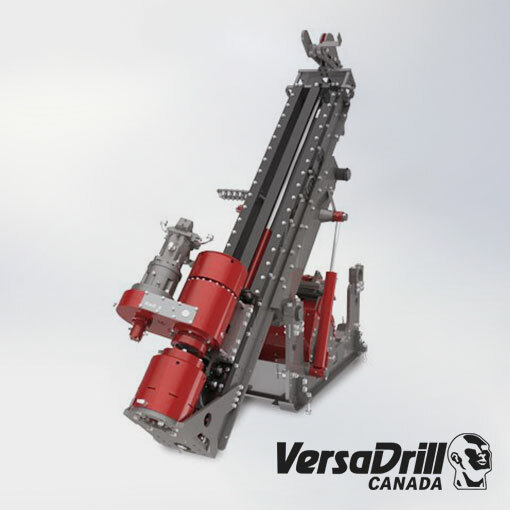 The soil nail drill rig, offers configuration options, in the drill head or drifter and in the hydraulic power source. The soil nail equipment is very easy to use and to transport. 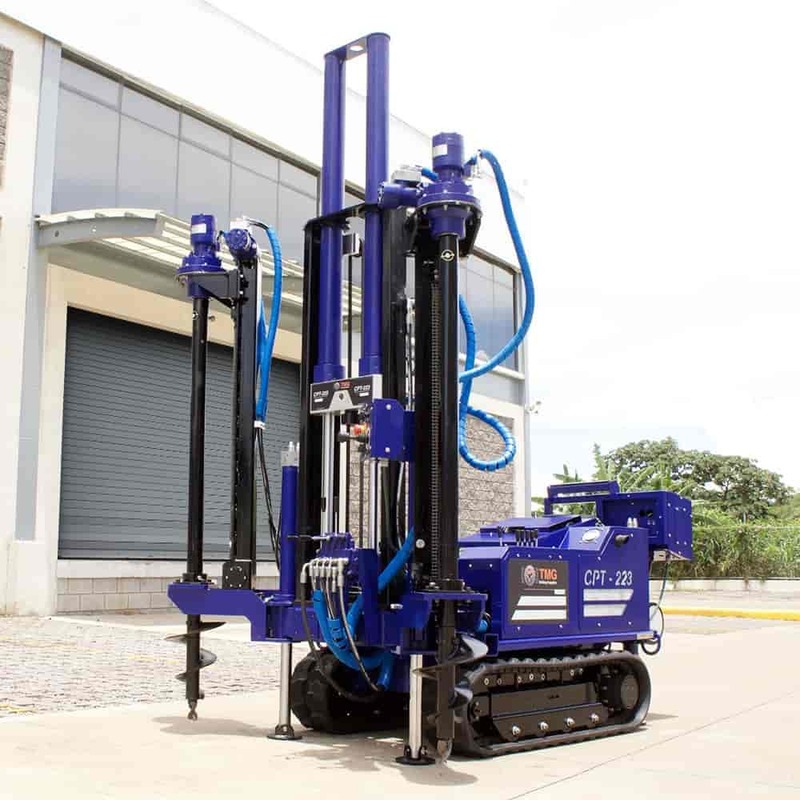 These small but powerful drill rigs come with a power pack and separate driller control panel and are specifically designed for underground core drilling. They can be ordered with either a diesel or electric powerpack. The chuck style drillhead and pipe clamp make underground drilling fast and efficient. The MA-13 is a small, portable, and easy to use SPT autohammer soil sampling system, which can be mounted on a small truck or trailer. 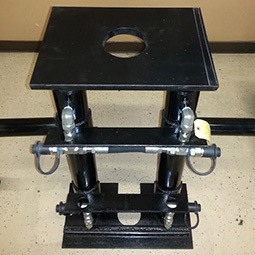 This rubber track carrier is the platform of choice for compaction grouting and foundation repair contractors, drilling and general contractors, landscape designers and farmers. TMG's SPT Tripod, is a lightweight and and easily portable SPT sampling system. Made from high quality aluminum, the tripod has two sections for easy of transport. The tripod kit comes complete with aluminum tripod, and 7hp geared gasoline engine and capstan. Manual safety hammer and rods sold separately. TMG manufactures a manual or smart laser DCP kit. The smart laser DCP kit provides data recording to the synchronized device via an app. More accurate test results are achieved in less time compared to the traditional method. Vertek’s SmartDCP is easy to operate by a single person. 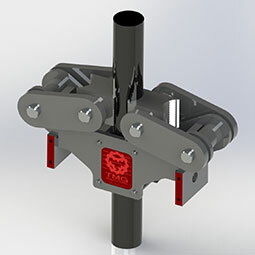 Our 4 speed drill heads come complete with top intake wetswivel, spring loaded flange adapter and a universal mounting plate and do NOT have any electronics. 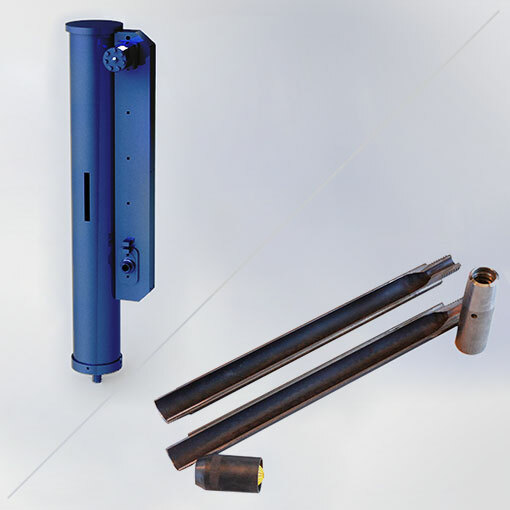 These drillheads can be installed on almost all makes and models of drill rigs and are designed for wireline core drilling, mud rotary drilling, auger drilling, water well drilling, compaction grouting drilling, and other rotary drilling. 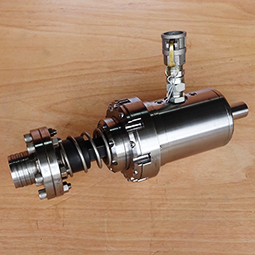 TMG Manufacturing manufactures and sells a line of SPT tooling for the Geotech driller. We offer Lynac split spoon samplers, manual SPT safety hammers, automatic SPT hammers, AW and AWJ drill rods and Shelby tubes. TMG is an authorized distributor of Roctest products. 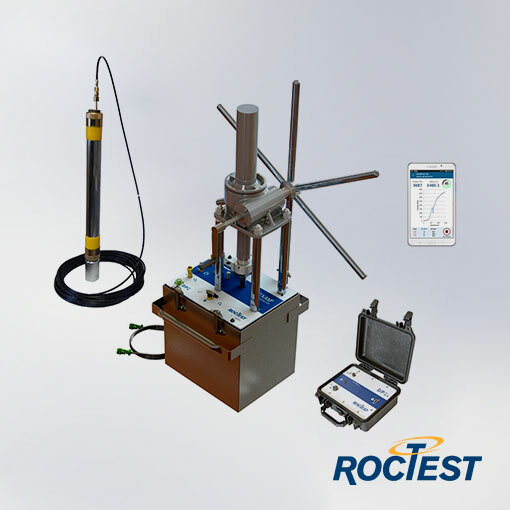 Roctest is the leading developer and manufacturer of geotechnical & structural instruments, soil / rock testing equipment and innovative sensing technologies based on vibrating wire and fiber optic sensors for geotechnical and structural instrumentation. TMG is an authorized distributor of AMS, Inc products. 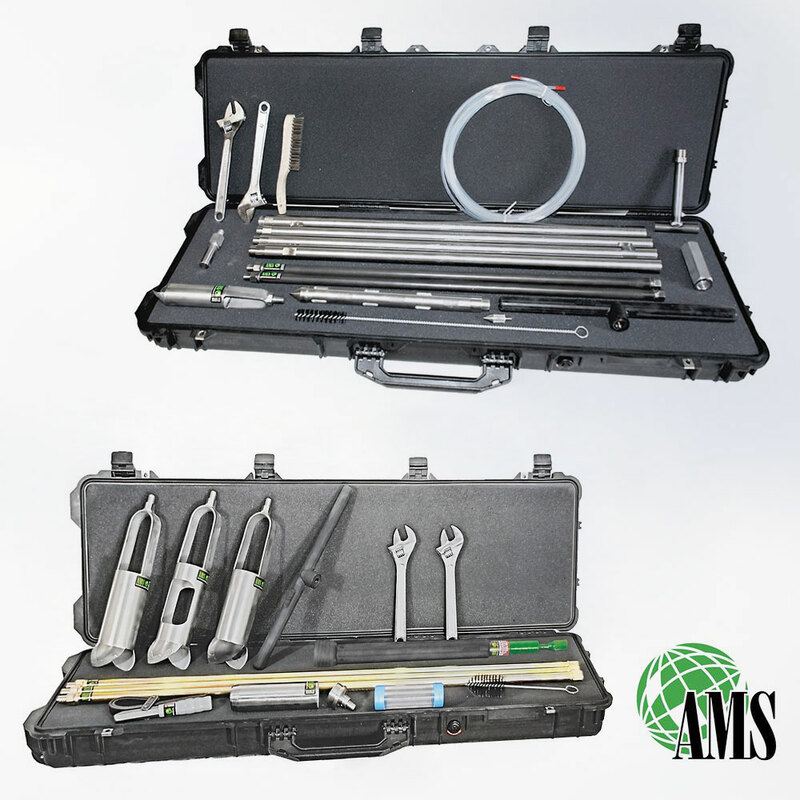 AMS is the leading developer and manufacturer of geotechnical & environmental soil sampling tooling and equipment, direct push sampling equipment and tooling and well management products. 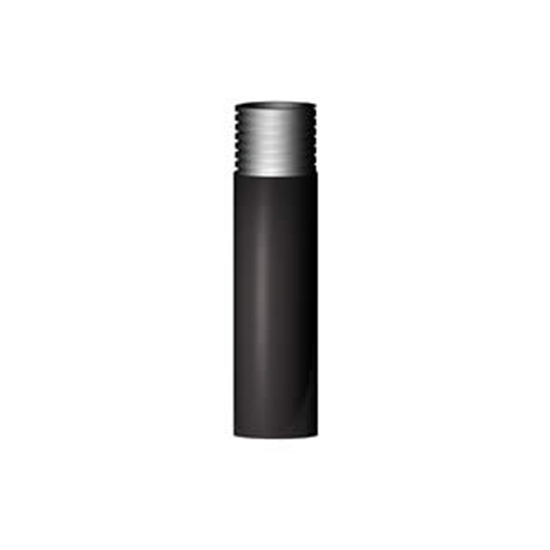 Our drill casing is designed specifically for the compaction grouting contractor. Standard sizes are 2.875" and 3.5". Our drill starter bits are made from high-tensile strength drill casing with four or six carbide-tipped teeth. This drill starter bit will penetrate rebar, concrete & asphalt with ease. 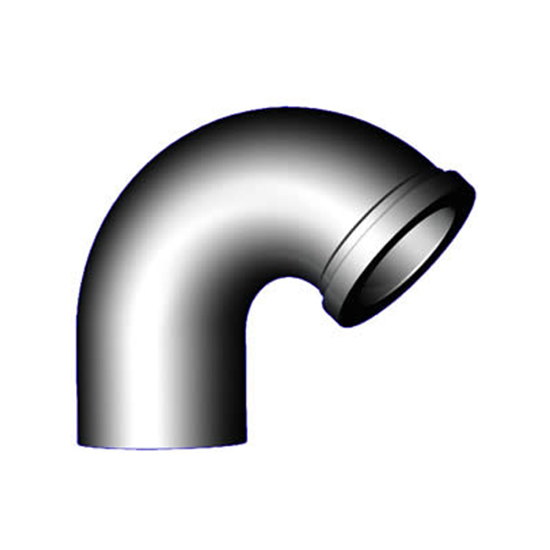 Our standard bowls and wedges are made from the highest quality 4140 annealed-hardened steel. The wedges are further flame-hardened at the teeth for added durability. Built to withstand the rigors of daily use, TMG's casing quick puller removes drill pipe quicker and more efficiently, making pulling pipe safer, easier and faster. 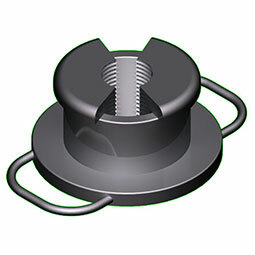 Our new heavy duty wet swivel is designed for high load drilling. This heavy duty wet swivel has a built-in spring loaded automatic float system. This allows for both automatic lifting during unthreading, and shock absorption during threading. 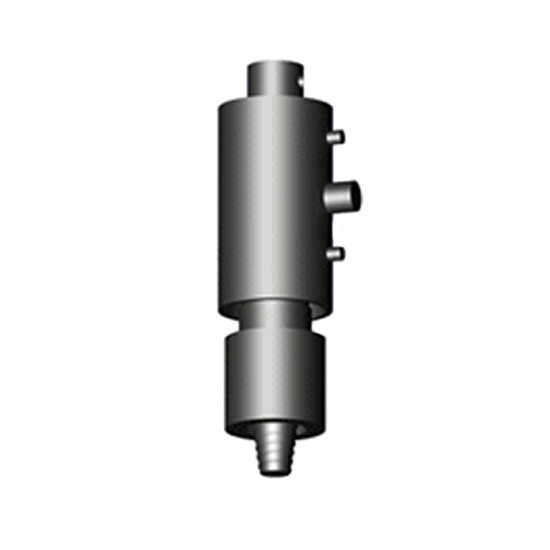 Our standard wet swivel assembly has a built-in casing adaptor and is made from 4340 pre-hardened, aircraft grade steel. Sealed with brass-backed, V-packing preventing the seal from extruding into the bearing at high pressures. 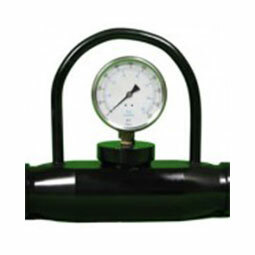 Our standard in-line pressure gauge has a one piece frame with built-in rubber diaphragm that is easily replaceable. 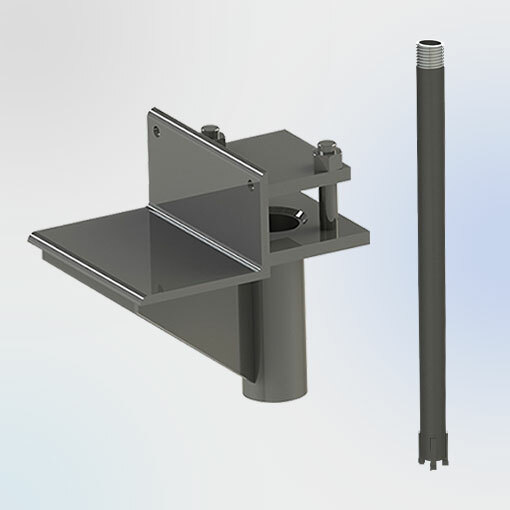 Steel U-frame handle provides protection for the gauge, as well as easy grab access. 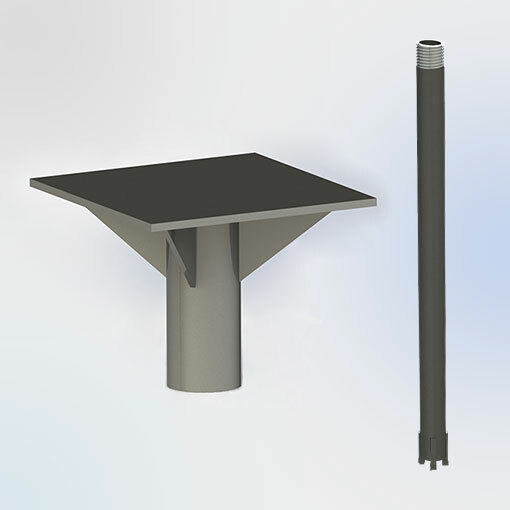 Our standard recirculation mud tub used for wet drilling is made from lightweight, durable 6061 aluminum. Mud tubs can be made to meet custom configurations and sizes. Pulling casing from the ground has never been easier. 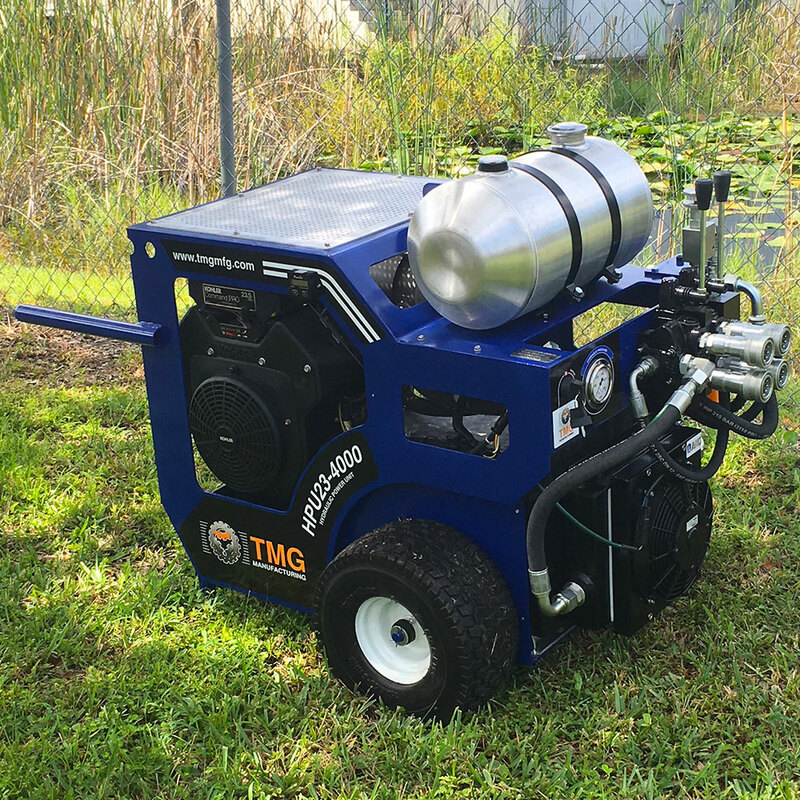 TMG’s casing extraction tool has two 3.5”, 24” stroke cylinders and an optional portable dolly. 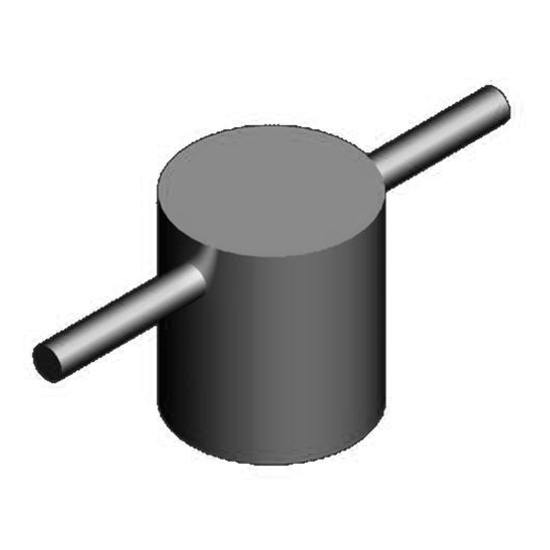 It is used with a set of bowl and wedges or TMG’s exclusive Quick Puller. 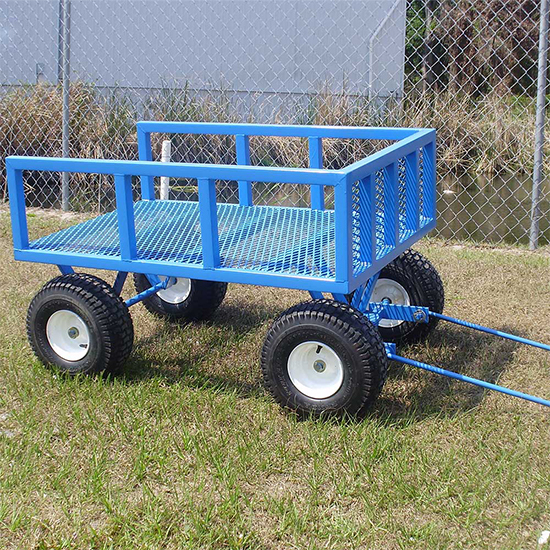 Our heavy duty pipe cart make transporting pipe around the job site easy and convenient. This cart readily stands up to the rigors found on any site. The all turf tires facilitate easy rolling to and from truck to job location. 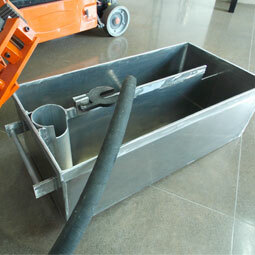 Carry pipe, tooling and small equipment quickly and easily. Keeping the jobsite clean is a must. 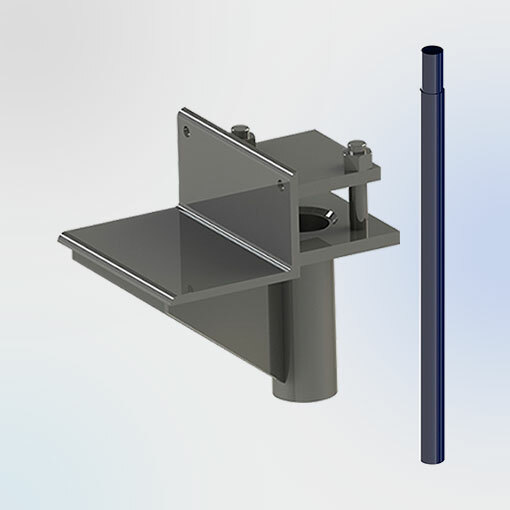 The washout T is used when flushing out drill casing, allowing the overflow to be collected in a collection tank. 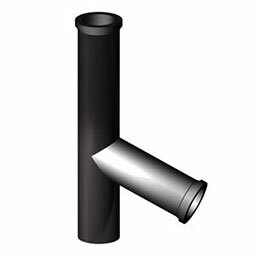 Our grout to casing connectors are made of high-tensile strength steel. Thread patterns or clamps are customized to the customer's needs and can be ordered with single or double start threads, clamp to clamp or clamp to thread. Standard sizes are 2.875" and 3.5" and are available straight or angled. 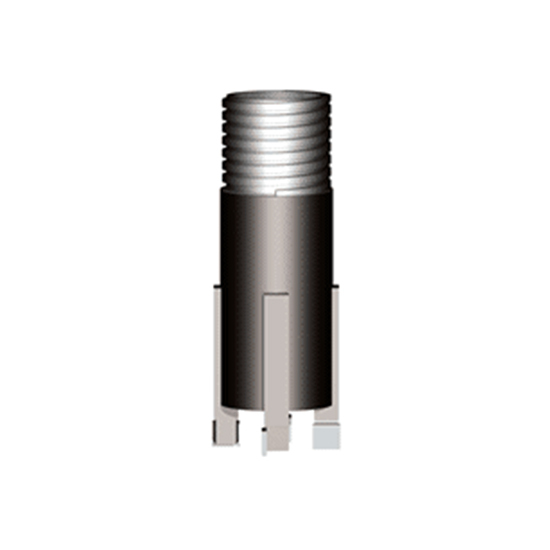 Our grout casing plug comes with handles and it is used to protect the casing threads and prevent grout or mud back-up. Handles are standard for easy twist on and off. Cap off the grout casing in-between drilling and grouting. Our underpinning push pier is ideal for many foundation repair applications, including those where the underlying soils are weak, unraveling or compressible. These strength-tested piers are specifically designed to be pushed through soil layers ultimately sitting directly on load-bearing strata. Our patented grout injection push pier adds an additional component of compaction grouting to our strength-tested standard push pier. 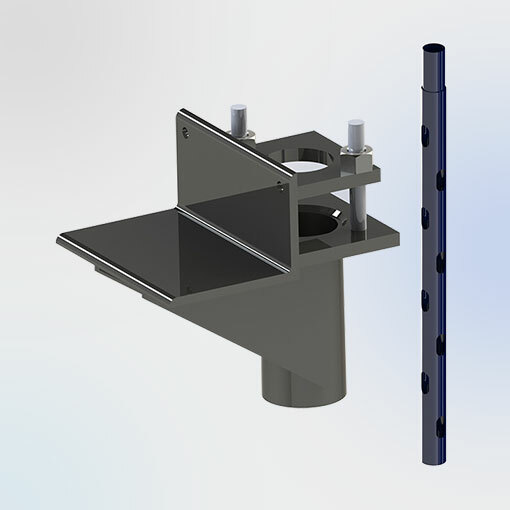 This system conveniently combines the advantages of both push piers and compaction grouting, allowing for both applications in one process, creating unparalleled support for the structure above. 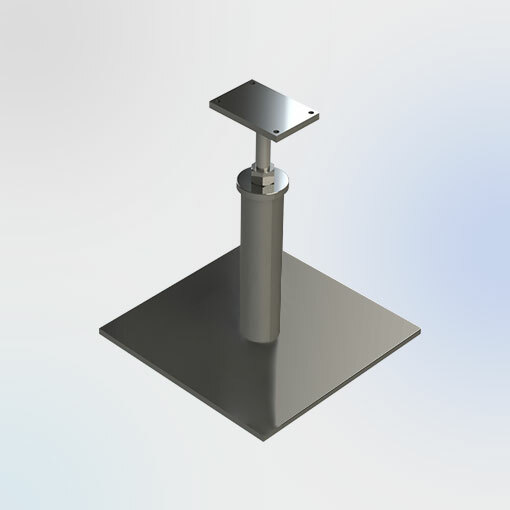 Our drill-in pier is ideal for many applications where soil conditions aren't conducive for push piers. Drilling in the pier ensures that difficult soil layers like clay and rock are accounted for and that the pier successfully reaches load bearing strata. Sections of our drill-in pier are easily screwed together using our unique triple start thread pattern. Helical piles are ideal in situations where push piers may not be indicated due to the depth of the load bearing strata. Helical plates are welded on to a strength testing center shaft which is then "screwed" into the substrate below. This process ensures that the soil integrity remains undisturbed and the structural load is adequately transferred from the foundation to pier and then on to the welded plates below. The interior slab bracket is designed and engineered for use on an interior foundation when it needs to be lifted, or supported to prevent further settlement damage. This bracket can be used in conjunction with standard underpinning, push pipe, injection push pipe, drill-in pipe and helical pipe. 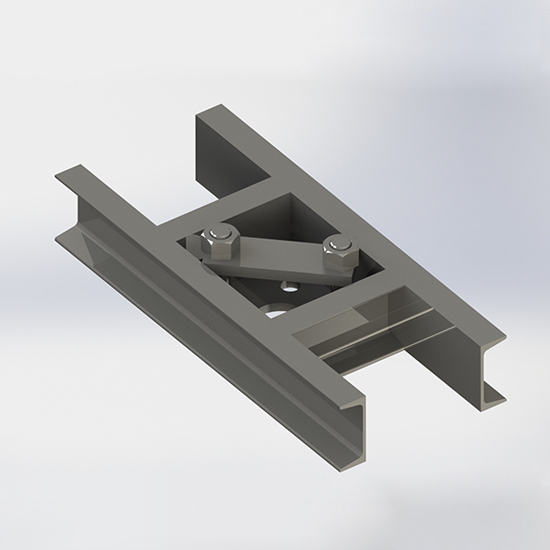 Our heavy duty crawl space brackets are designed to stabilize load bearing walls and sagging floors. 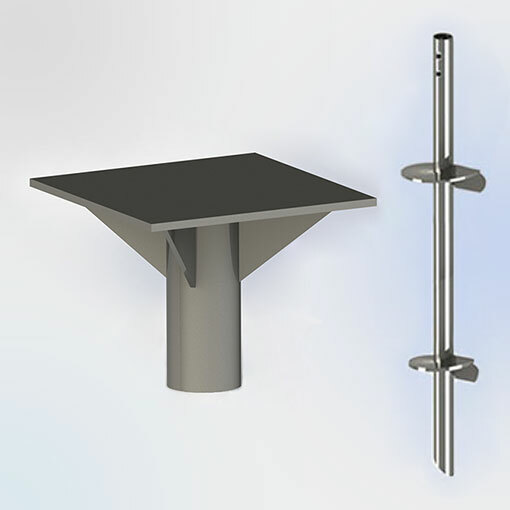 These brackets not only provide supplemental support to existing column supports but aid in the prevention of future settling issues. The bracket is seated directly on the ground. No pier is needed. 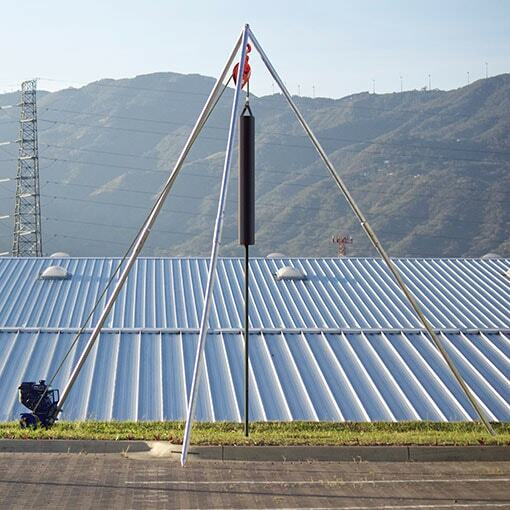 Pre-Construction piers are revolutionizing the construction industry. Placement of drilled-in piers prior to construction ensures the abatement of any settling or structural issues before they happen. These piers are perfect in geographical locations where loose soils may be problematic or clay soils may cause movement or heaving below the structure. Pre-Construction helical piers are ideal in situations where drilling directly to bedrock may not be indicated, and soils are relatively consistent and compact. These helical shafts are "screwed" into the soil prior to construction, transferring the structural weight to the helical plates which are solidly imbedded in the soil.